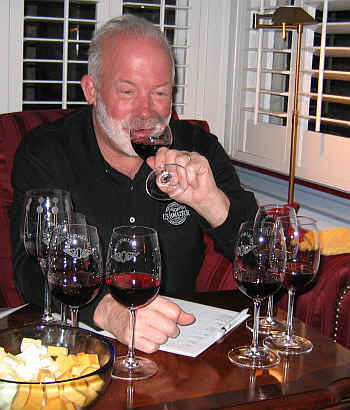 With Napa, Sonoma and Santa Barbara hogging the limelight on the stage of California wines, Vino Fino member John McGlothlin chose "Santa Cruz Mountains" Pinot Noir as the theme for this month's tasting. The appellation is not exclusive to Santa Cruz county, but extends to Mount Madonna in Santa Clara County at the southern tip to Half Moon Bay in San Mateo County as its northernmost extreme. Vines situated above the 400-foot elevation level to the west are included in the appellation, while vines on the east must be located at least at 800 feet. The region has a great history and many colorful characters. 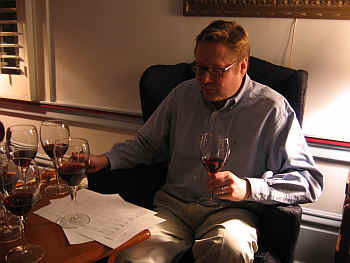 Emmet Rixford made famous Cabernet in the late 1800s. Paul Masson was a famous vintner as the 20th century began and this name still is viable as a brand, even though there's no connection with Santa Cruz winemaking any longer. Martin Ray was a famous character from the 1940s through the 1960s and his name is still seen on wine bottles today, though, like Paul Masson, there's no connection to Santa Cruz Mountains any more. Ridge Vineyards and Mount Eden Vineyards are, from our perspective, two beacons of light in the region. Some might argue to add the name of the David Bruce Winery to this list, also. For the most part, however, the region is well below the radar screens of most wine drinkers. 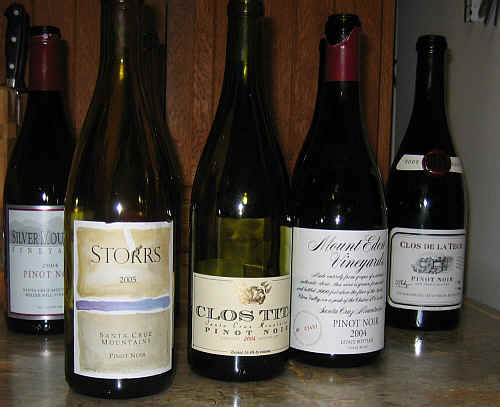 John McGlothlin, with a little assistance, assembled a set of currently-released Pinot Noirs and we tasted them on a cool January evening in San Francisco. 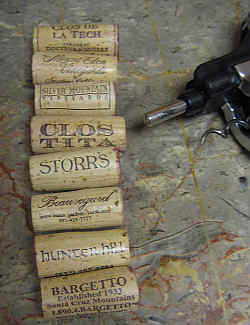 The wines ranged in price from reasonable ($25-$45) to unreasonable.($99). Having perused the website of the high-priced wine, it's clear the fellow is a fan of great French Burgundy wine. While we admire his quest for grandeur, the word "delusional" came to mind when we unveiled the wines. One wine was well ahead of the pack, followed by two good efforts. 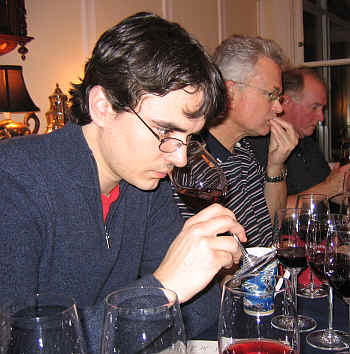 Four wines were within a few points of each other at the bottom end of the rankings. Our last place wine comes from a Woodside vineyard encompassing one acre. 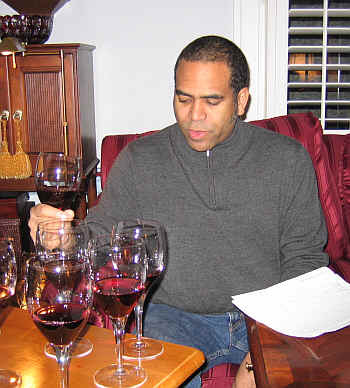 Proprietor T.J. Rodgers has been quoted as saying he's going to grow the best Pinot Noir in the world. Maybe some day he will, but this wine was curious for a variety of reasons. The color was of medium ruby red. It displayed an odd perfume reminding me of some sort of candy...perhaps a fruity taffy. As the wine aired, I found it more reminiscent of some Aussie Shiraz wines in the context of a line-up of Pinot Noirs. Fruity and floral...violets? Candied violets? It did not seem bone dry to my palate and it showed a jammy quality to its flavor. Medium-light bodied, it's candied and reminiscent of strawberry jam. It's not a "bad" wine, but it's a far cry from Burgundy and despite its proximity to its competitors, a ways away from good "Santa Cruz Mountain Pinot Noir," too. No stars on my three star scale. With medium-garnet color, this youthful bottle comes from one of the old-timers in the appellation. The Bargetto family has been making wine since the 1930s. This has a light cherry fruit note to its nose, but the alcohol hits you before the actual fruit fragrance arrives. It's dry and is a bit light on the palate. I found the wine to have a bit of tannin, but it's got nice texture and is dry and "correct" in terms of varietal character. Perfectly pleasant, I gave this wine a one star rating. It probably needs 6 months to a year to blossom a bit. Medium-light ruby red in color, this wine started off with promise. I liked the ripe cherry aromas and hints of beet root. It's dry and balanced, with medium-light body. The wine shows a modest amount of tannin and a hint of a resiny flavor. Overall, it's a nice, light, simple Pinot Noir. I didn't award it a star, however, but it's a perfectly pleasant red wine. Significantly lighter in color than the rest of the field, this was reminiscent of a dark ros. There's a cherryish aspect to the fruit, but I found it veered off more towards the spice notes of cool climate Syrah wines. It's dry and balanced, if a bit light in body. Lean and wiry, it's very simple and shows a touch of peppery spice on the palate. Standard. I was more enchanted by this wine than the group, finding medium+ garnet color and a lovely nose. It was a wonderfully 'pure' expression of Pinot Noir, showing beautifully fruity aromas of red berries and strawberries. Very fine. Dry and nicely balanced, the wine is mildly tannic and yet it has sufficient fruit to balance the astringency. I liked its long finish, too. Two stars. Fine. Medium garnet in color, this wine had a candyish aspect to its fragrance, but was not as extreme as the Clos de la Tech wine. It's got a sweet fragrance with nice berry notes...strawberries on the order of a fine "cru" Beaujolais. The wine is dry and balanced, having medium body. Nice fruit on the palate with light tannins, I felt this had a 'soft center'. One star. Nice wine, but a bit less compelling than I'd have expected from such a storied estate. For me, this was the most 'Burgundian' wine of the tasting. It's medium garnet colored and has easy-to-identify Pinot Noir fragrances. There's also a bit of a funky, herbal, leafy tone on the nose which reminded me of some lovely French Burgundies. I also found some notes of mint and resin, along with a faintly earthy tone. Gevrey or Nuits? Dry on the palate and nicely acidic. I faulted it for being a bit warm on the palate (I was surprised to see it's more than 15% alcohol!). 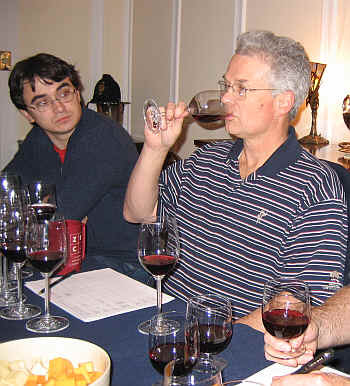 The Storrs winery routinely is one of the leading lights in Santa Cruz winemaking. We have often been delighted with their wines and yet they remain a bit "unheralded" in the connoisseur market. This wine shows a medium ruby red color and deep, berryish Pinot Noir fruit. There's a nice hint of vanilla bean to the nose with a woodsy undertone, yet it's not a wine you'd describe as oaky or woody. It's a medium+-bodied Pinot Noir with pure dark cherry fruit notes. This is supple and round on the palate, with light tannins and a few years of cellaring potential. Very fine. One-and-a-half to two stars.